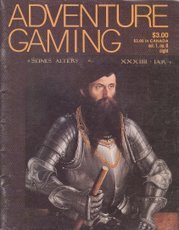 Variant rules for the nobility in Traveller; Starting Over by Tim Kask; The Joys of Napoleonic Wargaming; Heroic Combat in Divine Right by Glenn Rahman; Foreign campaign supplement by the designer for TSR's Knight of Camelot; Rules for developing NPC personality traits in RPGs; more. 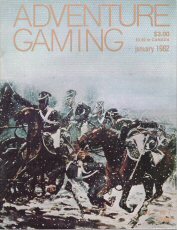 Getting Started in Historical Miniatures; Diplomacy variants by Lewis Pulsipher; Magic Kisses in AD&D; Variant rules for Avalon Hill's War at Sea board game; more. 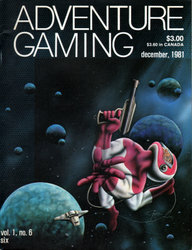 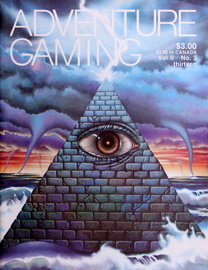 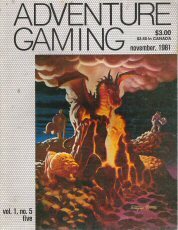 (Nov 1981) Contents include: "Evolving Forces In TITAN" by Dave Trampier; "The History of TITAN" by Jason McAllister; "Waging TITAN -Tactics" by Jason McAllister; "The Chaos of Battle: Partnership Boardgames" by Lewis Pulsipher; "Coming of Age on Cidri -- pre-adventuring experience in THE FANTASY TRIP" by Harry White; "The First Romulan War Pt. 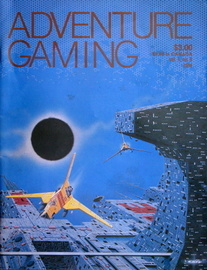 II -- STAR FLEET BATTLES scenarios" by Rick D. Stuart; "Everything ... To Know About Atari SPACE INVADERS" by Mark Cummings; "What Our Hobby Needs Is A Yearbook" -- Guest Opinion by Lewish Pulsipher; "INTERVIEW - Al Leonardi, co-designer of ACE OF ACES, Pt II"
Contents include: "Stranded on Arden" - a short adventure for TRAVELLER by Marc Miller; "Variant Rules for WAR IN EUROPE"
CONTENTS: Introducing Newcomers to FRP by Lewis Pulsipher; Going For Baroque - A variant for Down With The King by Glenn Rahman; From Tree-Limb to War Hammer - A history of smashing weaponry; Developing a Playable City Campaign; more. 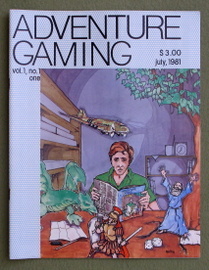 CONTENTS: Hardware Wars (Traveller); Orchestrating An Expedition by Lewis Pulsipher; Squad Leader Variant Scenario #2; May Your Eyeballs Shrivel And Your Nose Fall Off (curses); Simple Rules for Fantasy and S-F DIPLOMACY by Lewis Pulsipher; more. 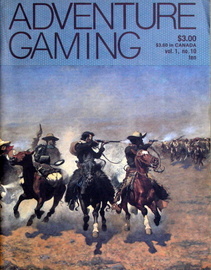 CONTENTS: Hardware Wars - Part 2 – Seeing the Light: Lasers and other energy weapons continued (Traveller); The Big Horn Basin Range Wars (A roleplaying campaign for FGU's Wild West, with suggested character conversions for TSR's Boot Hill); more. 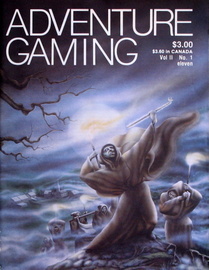 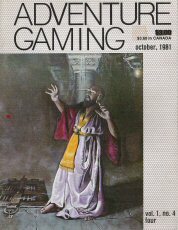 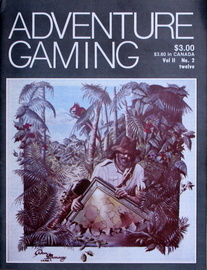 CONTENTS: The Horror on Old Hill (adventure for Call of Cthulhu); Hardware Wars - Part 3 – Seeing the Light: Energy weapons continued (Traveller); Mix and Match Battles with SPI's Prestags Series; Rules for creating believable magic shops for any fantasy roleplaying game; The Adventures of Finieous Fingers; Adventures of Space Trader Vic; more. 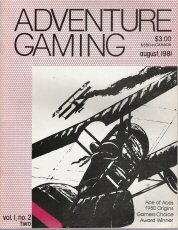 CONTENTS: Legendary Powers of Metals, Gems and Woods; In Search of Dragon Pass (Runequest); Fox 2 (fighter operations and tactics in Traveller); Boardgame Talk (SPI and its acquisition by TSR); more. 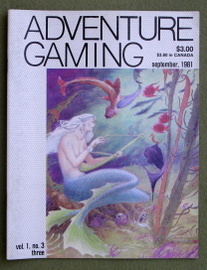 CONTENTS: Spell Law – A More Ordered Approach to FRP Magic by Terry Amthor; ILLUMINATIng the Hidden Persuaders; The Real Illuminati by Steve Jackson; Fox 2 - Fighter Pilot of the Empire, part 3; Legendary Powers of Metals, Gems and Woods; Grimm of the Gameboard World - The Return of Dargoll: part two by Gardner F. Fox; The College of White Magicke - a new college of magic to DragonQuest; more.